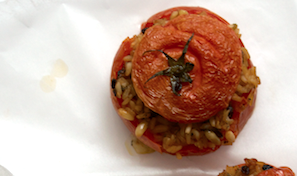 Stuffed tomatoes are another in the delicious line of traditional Greek stuffed vegetables, or gemistes. 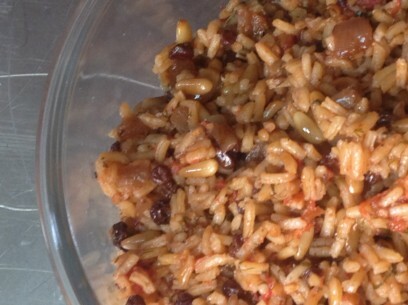 This recipe also features the very Greek use of sweet, dried fruits in savory dishes. regulars in your dinner rotation. Try to find large meaty tomatoes all of similar size and shape. This will help to ensure even cooking and lends to a lovely looking platter on your table! Slice even lids approx the same size for all your tomatoes and use a thin edged spoon to scoop out tomato insides. Remember to reserve a cup of the insides to mash and add to the filling. And take the time to find currants and pine nuts. 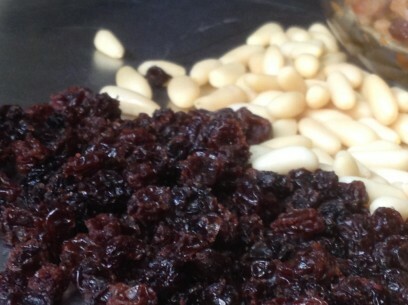 Pine nuts are available most of the year in large groceries but currants may require a little more searching. I stock up when I find them in my local market and keep them sealed in a freezer bag. Dried currants last for up to a year or longer this way and freezing is a simple way to keep them on hand year round. The crunch of the nuts and sweetness of the currants turn this dish from side to main course. The textures and flavors are such a fantastic combination of authentic Greek cooking, stuffed tomatoes really are an exceptional representation of authentic Greek food. You can make filling ahead up to 5 days, covered, in the refrigerator. Remember to bring filling to room temperature before filling. Slice off top of each tomato to make small lids. Scoop out insides of tomatoes and save 1 cup. Mash tomato insides well and set aside. Toast pine nuts in pan over medium heat for 2-3 minutes until very lightly brown. Finely chop and combine fresh herbs. Set aside. Saute onions until soft then stir in rice and cook on low for 5 minutes. Add pine nuts, currants, herbs, tomato insides, rice and 2 cups water. Bring to simmer, cover and cook for 10 minutes. Allow filling to cool for approx 10 minutes before filling tomatoes. You can make filling up to 5 days ahead of time and keep covered in refrigerator until ready to fill/bake. Remember to bring to room temperature before using. 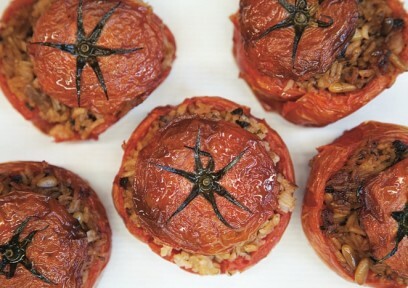 When ready to bake, fit tomatoes into a pan which holds them snuggly and fill each tomato to the top with rice filling. Cover filled tomatoes with lids and brush tops and sides with olive oil. 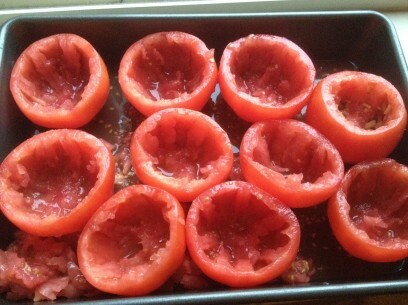 Add 3⁄4 cup warm water to the bottom of the pan in between stuffed tomatoes and bake for 1 1⁄2 hours in 375° oven. *a 9” round cake pan works well for eight large tomatoes. I have an allergy to pine nuts, any other suggestions? Do you think this could be made using cherry tomatoes – as hoes d’oeuvres? And if so, what might the baking time be? This is a bit delayed but cherry tomatoes are so small. Maybe try the Campari (??) tomatoes which are bigger than cherry but usually smaller than regular tomatoes. My mom used to use golden raisins instead of currants. O do not believe you can achieve the wonderful taste of stuffed tomatoes when using cherry tomatoes. There are a lot of ingredients going into them (larger tomatoes) to imitate the real taste. Your recipe was easy to follow and the Yemista were delicious. I added some potatoes to the pan as an accompaniment. Thanks for sharing. Is there another way to stuff these with out the dried fruit and nuts or meat? Thanks so much for this recipe – it will now be part of my regular dinners and lunches. I ate it with a little sauce made of tahini, water, lemon and garlic for dinner, and leftovers with a bit of feta cheese on the side for lunch. Yum yum yum yum yum. They sound amazing, but I’m always confused with the baking part. Do you cover the baking dish or bake them in an uncovered pan? I’m making these tonight, and eating the leftover stuffing while I wait! Yum yum yum. This will be a great recipe to take to a potluck!